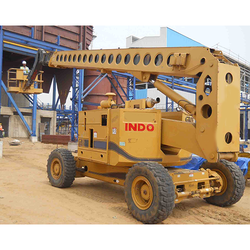 As a customer-focused organization, we are providing a wide array Electric Articulating Boom Lift. In addition to this, we are providing these products at very leading prices. Mounted Boom Lift is especially useful for applications that require high reach capability, but don't require a self-propelled unit. It is ideal for tree trimmers, construction, small manufacturing facilities, parks and municipalities. - Also known as Cherry Picker, Man Lift, Bucket Crane. - Diesel and Battery Operated Options available. - Heights upto 45 meters available. - Operator charges inclusive for 10-hour shift. Rough Terrain Performance :Oscillating axle and 4-wheel drive get you over rough terrain easily. Better Maneuverability :Optimum maneuverability with 4-wheel steer. More comfort :Automatic platform levelling provides operators comfort. Extra efficiency :Models with jib offer extra working ability to hard-to-reach area. 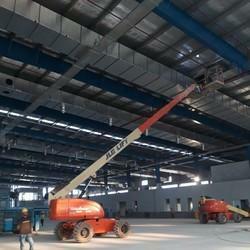 We are a reputed name of this domain, which is engaged in supplying an optimum grade articulated boom Lift. Sourced from certified vendors of the market, these boom lifts are in compliance with industry laid quality standards. High grade material is used in the manufacturing process following industry standards & norms.